Talk about a roller coaster year for China! Stock markets shot up in the first half before crashing spectacularly. They've recovered since but the underlying reason for the summer slump -- worries about China's slowing economy -- hasn't gone away. And the chorus of concern is getting louder again. The numbers certainly don't look great: Quarterly GDP figures reflect China's worst growth since the financial crisis. Growth for 2015 as a whole, due out in January, is likely to be pretty ho-hum even though official data may still hit the government target of around 7%. On top of that, China's currency is on the skids, and several top executives have been swept up in government investigations into corruption and insider dealing. 1. How weak will growth be? The old days of breakneck growth are long gone. Economists surveyed by CNNMoney are expecting 6.8% GDP growth this year, and 6.5% in 2016. It's a far cry from the double-digit growth rates China used to enjoy, but both government officials and economists seem to think things are on track. They say China will need to average annual growth of 6.5% for each of the next five years to hit its goal of boosting the economy to around $12 trillion by 2020. That would represent an ambitious doubling in the size of China's output in just 10 years. And it will only happen if the country's services sector -- for example, education and travel -- continues to expand rapidly as factory activity shrinks. Already, the balance is changing: Services now contribute around 48% of China's GDP, according to the National Bureau of Statistics. And economists say the move away from manufacturing -- worth 43% of the economy last year -- will continue. 2. Are more rate cuts coming? Despite growing worries about China's economic slowdown, Beijing shied away from unleashing major stimulus this year. Instead, the government unleashed "mini-stimulus" measures, cutting interest rates a number of times, lowering the amount of cash banks are required to keep on hand to encourage lending, and accelerating infrastructure projects. Allowing the currency to fall should also have given a boost to exporters. A big government meeting in March will be the next major review of policy. But economists aren't holding out for a "big bang" stimulus package. "We expect increased fiscal and lending support for infrastructure investment, but no massive new stimulus package," said UBS economist Wang Tao. Still, there could be two more interest rate cuts early in 2016. 3. 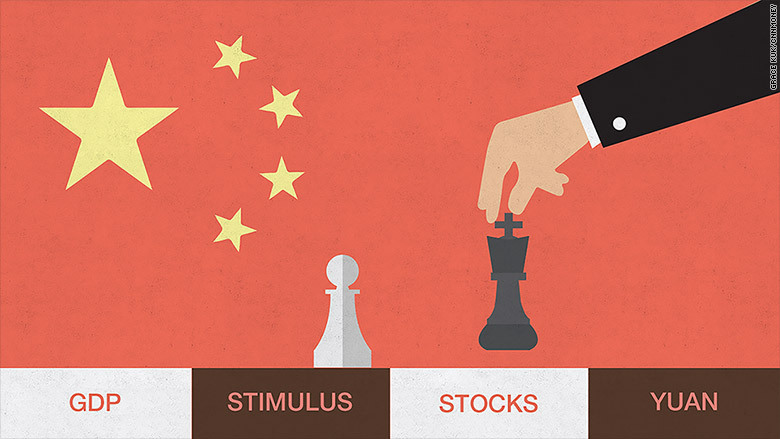 Can China calm its markets? While most of China's markets are still dominated by domestic investors, Beijing wants to encourage more foreign participation. Extreme volatility this year will make that much harder. The government has taken some steps to combat crazy market swings. China will adopt circuit breakers starting Jan. 1 -- essentially an emergency brake, that will halt trading for 15 minutes if a main Chinese share index swings up or down by 5%. Regulators are also considering changing the rules for companies that want to go public. Beijing only recently lifted a four-month ban on IPOs. There are plans to link the Hong Kong and Shenzhen exchanges in 2016, giving investors in both places access to both markets. But experts say China will have to rebuild investor confidence, both at home and abroad, if the link is to succeed -- a similar program this year between Hong Kong and Shanghai flopped. 4. Will the yuan keep falling? The yuan, also known as the renminbi, is down nearly 5% against the dollar so far this year, and analysts think the currency has further to fall, reflecting weaker growth and trade. One of the economists surveyed by CNNMoney estimated that the yuan could dip to 7.50 against the dollar by the end of 2016 -- a 16% slide from current levels. China has been working to get its currency accepted as a global player in trade and investment. In November, it received a stamp of approval from the IMF, which agreed to include the yuan in an exclusive basket of currencies starting Oct. 1, 2016. But with its currency now in the global spotlight, China is under even greater pressure to allow market forces to play a greater role. As part of that effort, the government announced last week that it would start tracking the value of the yuan against a basket of world currencies -- rather than just the U.S. dollar. Around the world, the yuan is growing in importance. In October, it became the world's fourth most-used currency for international payments, according to Swift, an organization that provides global transaction services.